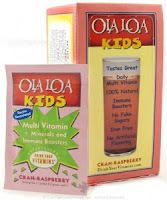 Get FREE sample of Olaloa multi-vitamins drink mix. All you need to do is simply fill out the form to get yours. NOTE: After you submit this form, you will receive a confirmation email with a verification link that you will need to activate. If you fail to receive this, please check your spam filters and set them to allow incoming email from drinkyourvitamins.com. Once you receive the email and complete the verification process, we'll send you not only a free sample packet of our delicious ENERGY multi-vitamin, but also a packet of our thirst-quenching SPORT formula—a $2.50 value!